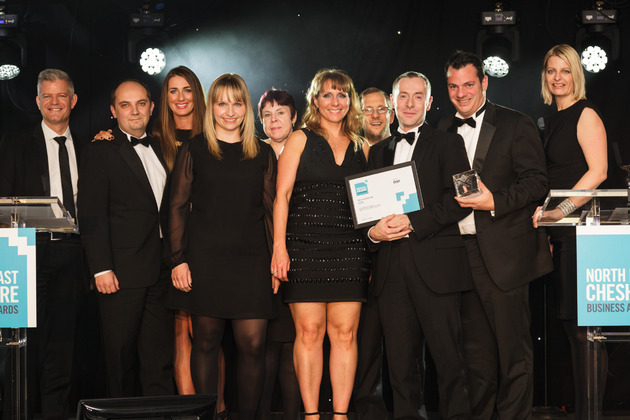 ~~Macclesfield based IT solutions firm Axon has won Business of the Year: Turnover £1 - £5Million at the prestigious North East Cheshire Business awards. Celebrated at a gala dinner which took place on 26th November 2014 at The Mere Golf Resort and Spa in Knutsford, the 12 award categories, which were open for entry to businesses from across North East Cheshire, recognised outstanding achievement, leadership and a positive contribution to the success of the local business community. Axon, which celebrated a record year in 2014 with a 40% increase on the previous year’s trading taking revenues from £1,136,000 to £1,585,000, was recognised for its recent rapid growth, provision of technologically advanced and relevant business solutions and strategic plans for future expansion. Based in Macclesfield, Axon became a cloud computing specialist in 2011 and was the first company in the North West to achieve Microsoft Gold Partner status with Virtualisation Competency. Since this time the firm has seen revenue up by 88%, profit before tax by 622% and customer base by 21%. The firm also boasts an 86% customer retention rate and an 80% staff retention rate. Specialising in the design, implementation, troubleshooting and provision of business-focused end-to-end cloud computing solutions Axon invested more than £50,000 into data centre space and some £100,000 in renovating new office space at Lyme Green Business Park in Macclesfield, to enable the provision of public, private and hybrid cloud solutions and VoIP telephony as well as data backup, connectivity, IT security and technical support. In January 2011 Axon became the first business in the North West to be awarded Microsoft Gold Partner status with virtualisation competency, followed in July 2011 by the title of Microsoft Cloud Accelerate Partner. In 2012 Axon won Best Use of Technology in Business at the Cheshire Silk 106.9 awards.